Coach Popovich has 4 NBA titles with the San Antonio Spurs. He has over 830 wins and his winning percentage is over .600 in the NBA. On Thursday night versus the Miami Heat, Pop decided not to play his Big 3 (Duncan, Ginobili & Parker) plus starter Danny Green. Nope, they were not injured and they were not even with the team since they went back to San Antonio on Wednesday night after the Spurs won in Orlando. Their four players actually flew back to Texas using commercial airlines. The announcement that the 4 players were not playing happened around a couple of hours before game time. I could not believe the story because I knew that the Spurs did not incur new injuries (Kawhi Leonard and Stephen Jackson were injured last week) from their last game, so I expected them to play all their healthy players. Now, Pop has done this before where he rests certain players like Duncan getting a DNP-OLD last year during the lockout season. People knew then at that time that something like that was going to happen due to the mileage and age of Duncan and Manu. What the coach did tonight surprised a lot of people especially the commissioner and the NBA. David Stern apologized to the fans who paid tickets since they got cheated from watching a regular game with superstars. Cable viewers also got screwed from seeing a possible NBA Finals preview on the tube but got a pre-season vibe to the game instead. 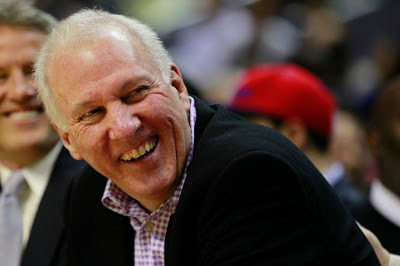 The commish promised that the NBA would levy "substantial sanctions" to the Spurs for sitting out their stars. This was a game that I was looking forward to watching. The Spurs are a top team in the West and it was supposed to be a great measuring stick game for the Heat to see how they match up to the Spurs. Coach Pop prevented us from seeing that on the court. As a basketball fan, I felt disappointed that the Spurs decided not to field their best players in a game where they were able to play. The Spurs kinda forfeited this game by sending home their top 4 players. I expected and hoped for a Heat blowout since they were playing their Big 3. If the Thunder can win a game over the much-improved Bobcats by almost 50 points and the Pistons beat the Suns by 40, the least the Heat should have won against the no-name Spurs was by 30. That did not happen since the game was close and Team B of the Spurs almost won it since the Heat was uninterested and unmotivated to play. No excuses for the Heat. They were embarrassing themselves by not playing with energy and effort. Now, does Coach Pop and the Spurs merit fines/sanctions? If YES, what kind? The NBA was probably irked by the fact that the Spurs decided to sit 4 players in a high-profile game that was being anticipated by a lot of people including myself. This game was on TNT where a national TV audience awaited the only basketball game during prime time. The NBA might have lost lots of ratings and TV is where the league gets most of their revenue. It does not help the NBA that the NFL also had a Thursday night game between the New Orleans Saints and Atlanta Falcons. The NBA needed all the help it could get by having a full slate of stars on the court. The Heat complied, the Spurs did not. I dont fault the mentality of resting players. I understand it more when players are hurt or when the season is almost over. But to rest healthy players in late November, that's kinda sketchy. Overall, it was the timing of the decision that hurt the Spurs and the NBA. The Spurs could have rested their players on Wednesday night against a weaker opponent (Orlando Magic) or maybe Coach Pop could have rested 2 on Wednesday and then another 2 on Thursday instead of sitting all four. Coach Pop knew the significance of the game being on TNT but he just did not care. His wallet might take a pounding for that decision. The NBA will probably hand down fines coming in six figures. A warning and a new ruling might come out about sitting star players without injuries. Although, Im sure coaches could circumvent such rules by producing fake injuries. How can the NBA police which injuries are fake or real? This is a slippery slope for the NBA. This is a tough (bad?) decision by David Stern to punish the Spurs for doing what they think is best for their team. I think the best course of action was to warn the Spurs about NOT doing it again... or at least the commish should have waited until the game was over before posting the announcement about the "substantial sanctions". Just imagine if the Heat lost that game after the Spurs "forfeited" the game. Does the NBA fine the Heat for not showing up as well? #Embarrassing.